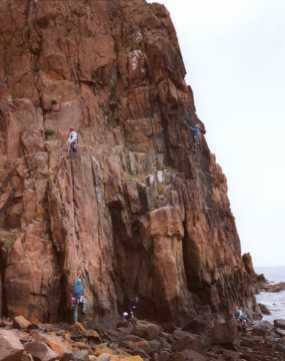 The Hawkcraig is a sea-cliff. It is also tidal, so check the tides before you go: these are under the weather in The Scotsman or BBC Weather - it's the time for Leith/Rosyth you want.) 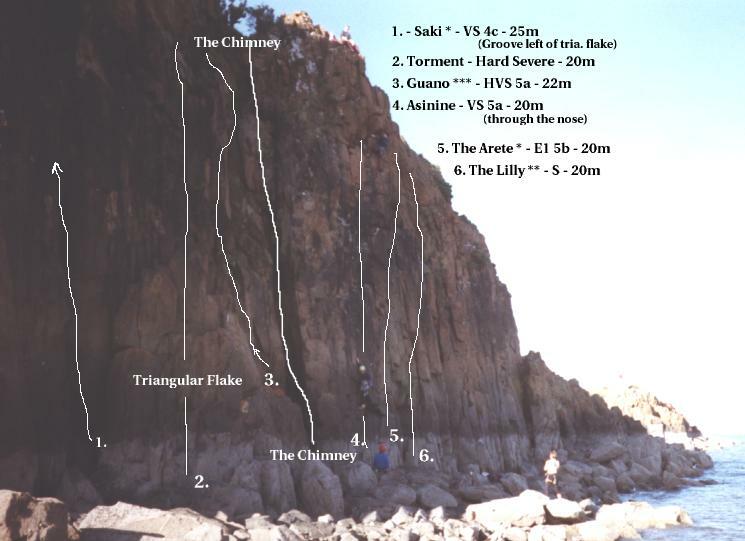 The longer routes are all affected by the tides, but you can abseil to some and boulder your way to others if you're that keen to climb them... alternatively, wait an hour for the tide to turn and climb something else. There are plenty of routes that are NOT affected by the tide. The view, on a clear day, is great. This couldn't be a nicer place to climb on a calm sunny summer evening. Views out across the river and Fife, and of the City of Edinburgh. In the river there are boats bobbing and islands just sitting there looking pretty... Trust me, you'll like it. On a bad day, with the waves chopping at your feet, everything can be a little intimidating, however, the rock is really good and you can still climb here if it's been raining. From the lighthouse you can simply head down to the water and traverse round to the routes. This is fine at low tide. Alternatively head up the hill and follow the path to the top, overlooking the hotel. You can down-climb here (Mod). 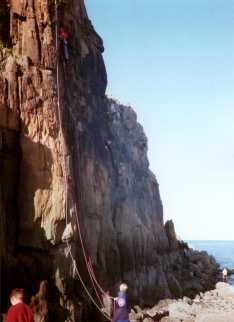 If you fancy it, you can always abseil. This might be neccessary to reach some of the routes at high tide. At the West (Hotel) end of the crag, down on the shore. You'll see a big recess with some nice crack lines in it. Further round there's a pillar rising from the shore to the highest point on the cliff. This is it. The rock is great, the holds are good, the gear is readily available. Climb the pillar direct. The easiest line is 4c but harder lines are easily wandered onto. The moves are continually interesting from the moment you leave the ground. When you can, stop for a moment to look down and around: you'll soon see why this route is the local classic. There's a platform above recess contining the crack lines (see above). Squirrel Slab is the obvious slab here. Short but worthwhile. Fish Head Arete and Fish Head Wall form the left wall of the recess. You can solo up and down these (VDiff) while you're waiting for your belayer or to get on Pain Pillar... These crack routes are short but fun. You should try them all if you have time. Eech (VS 4c) is the corner crack (heading up left) with the quartz in it. Cranium Crack (VS 4c) is right at the back and is very steep! (The holds are huge where it matters, though, just enjoy the situation.) Good gear. Conquistador Crack (VS 5a) - this is the short, sharp crack in the right-hand wall. Go for it! Sure, you can boulder here if ou want to. Most people don't, though. Soloing is very popular, though. 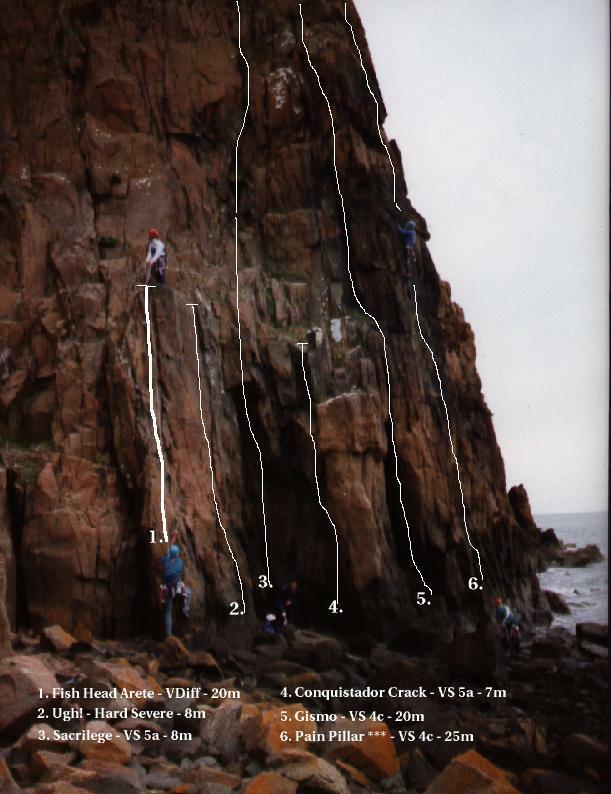 There are lots of shortish routes in the lower grades (Diff - Severe) that have some really 'interesting' moves. Characteristically, these tend to be right at the top. If you are driving take the Motorway to Edinburgh, and come off at the exit for Rosyth. This is the second exit before the Forth Road Bridge, heading South. Follow the signs for Dalgety Bay until you're on the main road, then you'll begin to see signs for Aberdour. Once in Aberdour, head for Silver Sands. Make your way to the South side of the Forth Road Bridge, cross it, (currently 80p for cars travelling north) and then take the second exit where rosyth quarry will be on your right. Follow the signs for Dalgety Bay until you're on the main road, then you'll begin to see signs for Aberdour. Once in Aberdour, head for Silver Sands. You can take your car all the way to the crag, parking at the lighthouse. Anyone wishing to do so can get the train to Aberdour. It's a 15-20 minute walk from the station to the rock. There are no access issues here, however, it would not be very clever to climb inside the hotel's grounds. Please help preserve good relations here. The Hawkcraig is only a few (15) minutes walk from the town of Aberdour, so you can use all the small local shops. You won't struggle to find a nice sandwich here as there are lots of tourists to cater for. In fact, there's a nice beach (which you pass in the way to the crag) which will have its fair share of hamburger/ice-cream salesmen in the summer. You can also buy fuel here, and there's a train station if you're not driving.